Hello lovelies! Today I have a long overdue post for you. Shortly before my holiday in December I received amazing nail mail from UK indie Opulent Essences. After falling in love with their hand and nail scrub (post here) I had to purchase more. I also decided to finally try a couple of their polishes. Read on for full swatches and more info! I'll start with the Hand and Nail Exfoliant Scrub - the main reason I ordered. I had wanted to try their baked apple fragrance since it was announced and I wasn't disappointed! I don't use cuticle removers so I rely on my scrub to remove any dead skin and to soften. This exfoliant is amazing at doing just that. I love it! They've recently added new fragrances and both fresh linen and lemon are on my wishlist. Now onto the polishes. First up is 'Raspberry Ripple', a gorgeous fuchsia pink with silver microglitters and a strong bluey/purple flash. This went on fairly sheer on the first coat, yet very smoothly and not at all streaky. A second coat built it up to be opaque. I added a third for extra depth and to deepen the colour slightly. Below is three coats and topcoat. This did dry to a slightly textured finish. A coat of topcoat smoothed it out but did dry down the tiniest bit textured again. If you're not a fan, you may want two coats of topcoat (or one thicker coat). Next is 'Peacock Pearl', a stunning tealy green full of a bright pearly shimmer. This was smooth and opaque in two coats, I added a third just in case it deepened the colour. It didn't make a massive difference so you could leave it at two. Below is three coats and topcoat. I will say that this is a lot greener than it looks in my pictures. The shimmer gives a gorgeous green sheen which my camera just didn't want to pick up. This is surprisingly my favourite polish of the three. Last up is 'Boutique Pink', a vibrant hot pink with a bright flash. 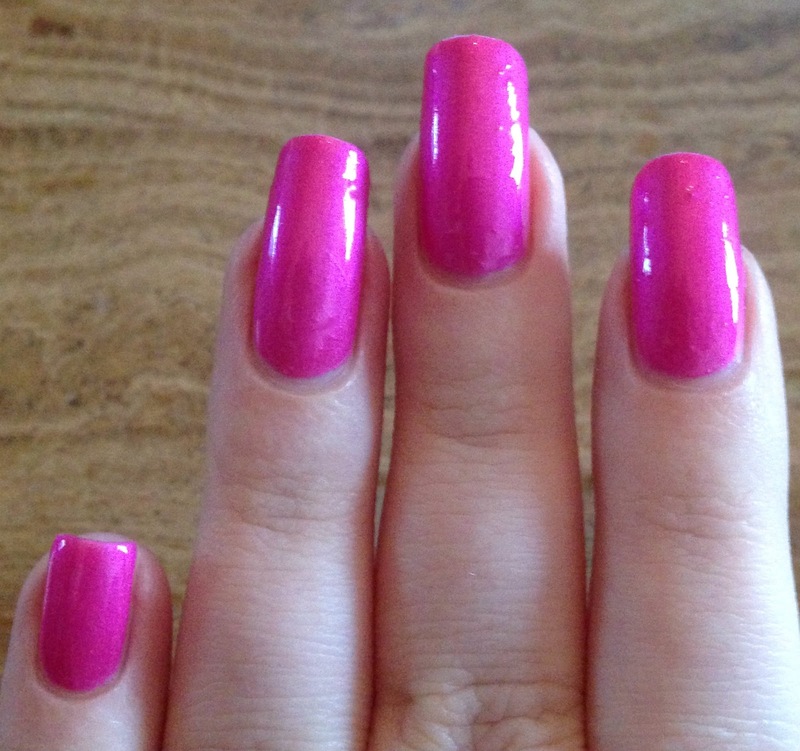 I received a mini size of this polish as a freebie with my order - thank you Sharon and Zoe! Again you could get away with two coats, but I added a third. Topcoat really makes this colour pop! Below is three coats and topcoat. I did have some minor bubbling with this one (not noticeable after topcoat!). It was probably my fault for doing my first coat a bit thick and a bit too quickly. I would suggest three thin coats to avoid any issues. I have to say I am very impressed! 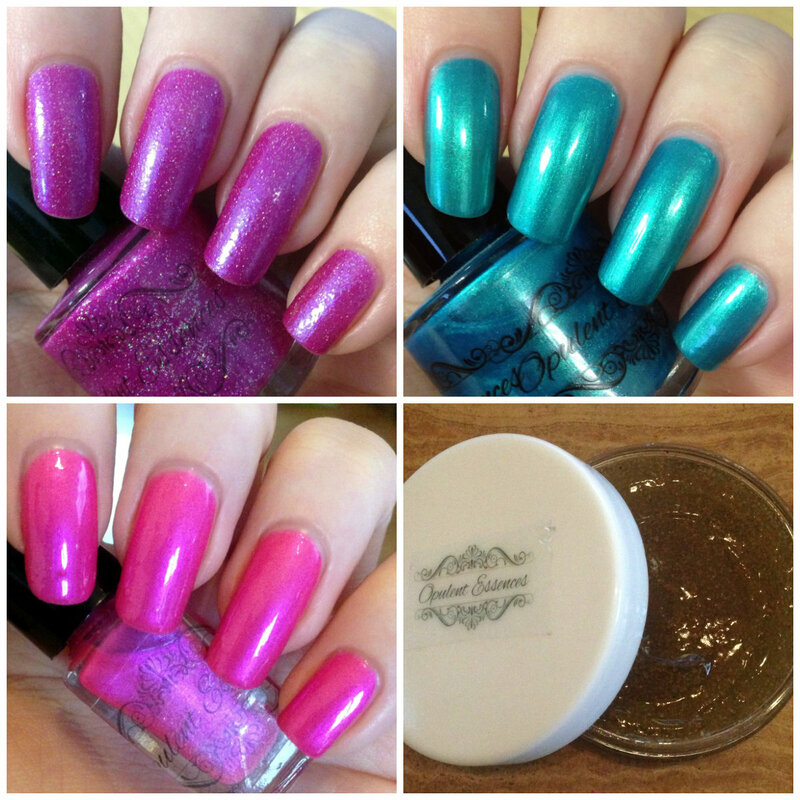 All three polishes were smooth and easy to apply, and were absolutely gorgeous on the nail. I will definitely be purchasing more polishes from Opulent Essences and of course will keep stocked up on my favourite scrub! Remember to check out their etsy store here.